Truck access platforms from Accuweigh are increasing driver safety on a weighbridge at the Hemmant depot of SEQ Hauliers in Brisbane. 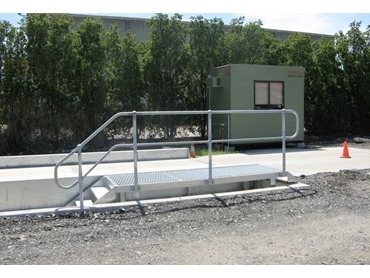 Supplied by Accuweigh’s QWM branch in Geebung, the truck access platforms are used by drivers when dismounting and re-entering their vehicles after accessing the weighbridge cabin. Typically, drivers use the main weighbridge I-Beams as a step to get off or re-enter their vehicles. This can be risky as the smooth surface of the beams can get slippery when wet, resulting in drivers sustaining substantial injuries. Accuweigh’s truck access platforms eliminate this risky practice as well as any potential for injury. Due to the slope of the ground where the weighbridge is positioned, an open pit foundation is used and the truck access platforms are fitted with guard rails to form protective barriers preventing drivers from accidentally falling into the weighbridge pit when returning to their trucks from the weighbridge office. Accuweigh’s truck access platforms are fully galvanised for protection against the elements and are custom manufactured to suit each individual application for increased safety. The truck access platforms at SEQ Hauliers are additionally fitted with steps down into the weighbridge pit to provide safe access during weighbridge maintenance and cleaning procedures. Australia’s leading supplier of weighbridges, Accuweigh has competently installed thousands of weighbridge decks throughout Australia and the Asia Pacific.